We’ve reviewed a number of binary trading scams recently, and today we have My Cash Bot on our hands. 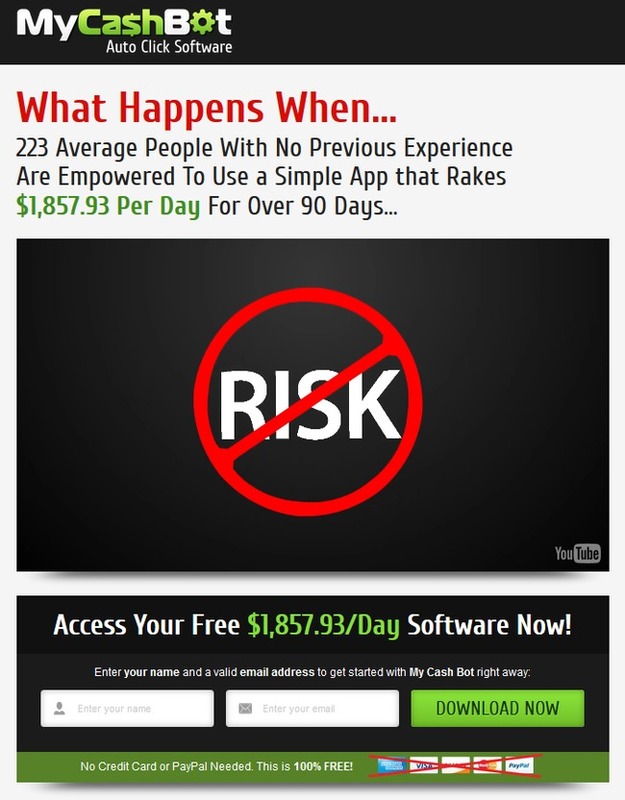 Is this the software that will finally make you a millionaire? Is My Cash Bot a scam? Let’s find out in My Cash Bot review. My Cash Bot claims there’s no risk using their system. Can they be trusted? Like many other binary software scams out there, My Cash Bot follows a predictable template when they introduce their system to internet users, much like Millionaire Blueprint by Walter Green and The Real Dream Maker by Kevin. There isn’t much distractions on the homepage, apart from the arbitrary earnings per day that My Cash Bot and many other scams use to attract the eyeballs of potential victims. If you wait for a bit, the embedded sales video starts playing, and it runs a good 19 minutes long. I’ve listened to the whole video to see what they have to offer, but to my disappointment, they did not provide any useful information at all. All you get to hear are the fake claims and lies of several actors and actresses. Everyone of them claims to have earned at least a million dollars from My Cash Bot scam. By the way, did you know that you can pay $5 on Fiverr and get someone to read your script like a testimonial? If you have time on your hands, you can watch My Cash Bot full video on YouTube and take your time to find the actors and actresses on Fiverr. My Cash Bot is nothing more than a binary trading software scam. Before we continue with the review, we want to briefly explain how binary trading works to make sure everyone is on the same page. Binary options is basically trading stripped down to its simplest form. Instead of reading financial news and analyzing complex charts, with binary options, you only predict if the price of an asset will rise or fall after a short period of time, usually between 30 seconds to minutes. There can only be 2 outcomes – either you are right, or you are wrong (hence the name binary options). Even though it sounds simple, profiting from it is a whole other story. This is how it works – for example, I predict that the price of gold will drop 5 minutes from now, and I bet $50 on a 5-minute contract. When the contract expires, and the price is indeed lower, I win and I earn a certain percentage of what I bet, let’s say 60% (which is $30). However, if I’m wrong, I lose the entire $50 that I bet. Put it simply, trading binary options is not that different from gambling. There’s no good way to predict the market’s movement in such a short period. In most cases, the traders only depend on pure luck and gut feelings. Even if you manage a 50% win rate, you will lose money due to the uneven winning vs losing payout of binary options. How Does The Cash Bot Work? 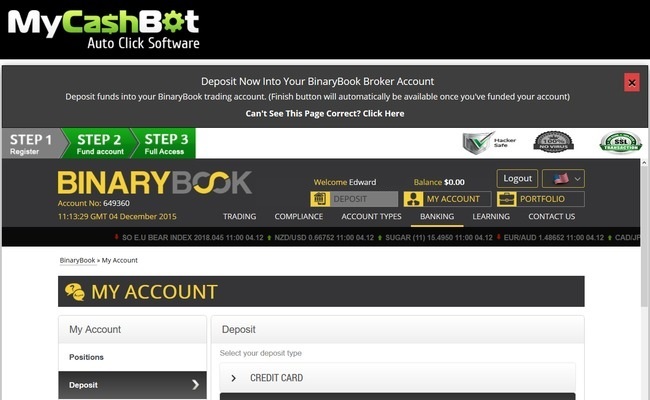 According to Dustin Crow, the alleged owner of My Cash Bot, winning binary options is very easy with his software. His software will decide all the trades for you, even a complete newbie can make a profit. My Cash Bot software will run on autopilot and make you a millionaire in 90 days, without you having to make any trading decisions at all. Can you believe it? Apparently Dustin Crow wants you to believe his outrageous lies by promising you easy money and instant riches. Instead of turning you into a millionaire, you are actually turning Dustin and his team into millionaires by handing your hard-earned money to them. Despite promising you no risks in their sales video, and that no experience is needed in their FAQs, My Cash Bot scam has some secrets hidden inside their earning disclaimer. We cannot guarantee your success or income level, nor are we responsible for any of your actions. Why does My Cash Bot include such terms in their earning disclaimer? It’s to protect themselves from legal actions when you lose all your money trading with their software. Despite the way they sugarcoat binary trading and the guarantees they provide in the sales materials, they will not be responsible when you lose all your money using My Cash Bot. Why Does Dustin Crow Promote My Cash Bot? You may wonder why Dustin Crow tries so hard to promote My Cash Bot and gives the software away for free. Firstly, if you decide to use My Cash Bot and register for an account through their sales page (which is an affiliate link), Dustin Crow and the team behind My Cash Bot will earn a sum of referral fee when you make your first deposit. You will need to deposit at least $250 on Binarybook before you can activate My Cash Bot and let it trade for you. Not only that, My Cash Bot will continue to make money off you over a long period of time. They earn a commission for every trade that the bot makes for you. The scary part is, My Cash Bot runs completely on autopilot. The trading frequency and trade amount is completely determined by them. To put it simply, they can decide how much commission to earn off you, as long as you still have money in the account and use their bot to automate your trades. Dustin Crow will profit regardless of whether you make or lose money with their bot, ALL ON YOUR EXPENSE. YES, IT IS A SCAM. As we’ve said in the review earlier, we don’t recommend binary options trading as a way to make money online, at all. It’s not that different from gambling, and using an automated trading software is no different. You are essentially putting your hopes and entire investment in a piece of software that gambles on your behalf. Sir William Bot Review – Scam With an English Accent?